“I had been struggling with my weight for some time and did not know the reason why. I took the Resting Metabolic Rate & VO2max Test in January 2014, and the results showed that Resting Metabolic Rate was very low (882 Calories per day). At the time I weighed 74.2 kg (my height is 162 cm). I needed to be around 65 kilos to be in the healthy range. After my test, Mark Barrett and Therese Fossheim worked out an training programme for me with the correct exercise for my metabolism. The results were amazing and very fast. Very quickly I started to see results as my weight came down and my health improved. After three months I have lost 8 kilos, and aim to lose another 3. I have Type 2 Diabetes, and now my blood sugar levels are in the normal range, my blood pressure has come down, my good cholesterol has gone up and the bad cholesterol has come down. My Dr is very pleased with my results and I have never felt better. I used to dislike exercise, but now I actually look forward to my daily exercise and intend to continue. I achieved my results by walking outdoors for one hour every day, as well as interval training using an elliptical trainer 3 days a week. Recently I purchased an exercise bike so that when the weather is not good for outdoor walking, I can use this as an alternative. I am also doing 2 x 90 minute Hatha Yoga classes each week. I intend to do the Metabolic and VO2 test again as soon as I have lost the further 3 kilos, and am looking forward to seeing improved Resting Metabolic Rates. From my mid 20s onwards I was active throughout each year with regular fitness and outdoor recreation activities. However, my weight stayed higher than it should be for a healthy weight – and it was easy to put on weight. With menopause, and changes in body shape it has been harder to keep my weight at a healthy level. Even on the occasions, in the last ten years, when I have managed to lose some weight, I have not been able to maintain that weight loss. 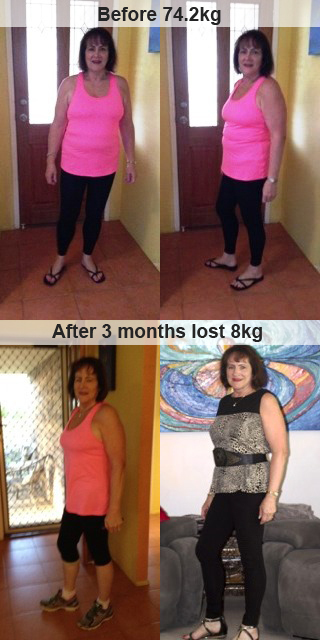 ritis) I have been eating a healthy diet – lots of veges/fibre, and low GI. So the food intake seemed to have little to do with my weight. The Physiologic testing confirmed for me that my low metabolism rate was a significant factor in my weight and any difficulties to lose weight. For the first eight to ten weeks of the sixteen week program there was little change in my weight – however, a resting test after two months indicated my metabolism was improving. The support from Physiologic staff has been excellent. Towards the end of the sixteen week exercise program, the weight loss accelerated. Over a three and a half month period I lost 10 kilos. I have been able to maintain the weight loss, and I continue to lose some weight. I continue to eat healthy food, and undertake regular fitness activities (including high intensity sessions). This lady started off with a low ability to burn fat at rest. The initial test shows 41% coming from fat (The ideal level is >65%). The metabolism training has gradually increased her ability to burn fat and she has now reached a healthier level where it is easier for her to manage her weight. Her ability to burn fat now at rest is 61%. “If you are looking to start a new exercise regime but don’t know where to start, have always been active but don’t seem to lose the weight or you are looking to improve your performances in competition, then metabolic testing is the perfect place to start. As a practicing General Practitioner in Queensland, I am repeatedly advising people that the only successful way to lose weight and maintain those losses is by a combining a calorie controlled diet with increased levels of physical activity. “But I go to the gym three times a week and I don’t lose any weight” or “I seem to have plateaued and stopped losing weight” are common replies. This is often because the activities you are doing, whilst better than nothing, are not tailored to your current level of fitness from a fat burning point of view and are not improving your overall level of fitness or raising your resting metabolic rate. Specifically designed exercise programs, tailored to you based on your metabolic test results can produce rapid and lasting results. For the motivated, this approach is guaranteed to work. From personal point of view, in 2009 I was 102 kg and barely able to huff and puff through 3km. Over the next 6 months I improved gradually but the weight wasn’t coming off as I’d hoped, considering the amount of running I was doing. On the longer distances, I was regularly coming over dizzy and exhausted about 80 minutes into the run. After performing a VO2 max test, I was able to understand that my aerobic baseline was low and my heart rate didn’t have to go that high before I was burning carbohydrates exclusively with no background fat burning. This was explaining my dizzy episodes and why I was no longer improving. “After completing the exercise metabolism tests for weight loss at Physiologic, I realised for the first time in my adult life i did not need to be running and almost killing myself to feel great and lose over 16kgs in a few short months – I was pushing myself to high and discovered that if my heart rate went over 116 I stopped burning fat…my knee’s love me again – life changing!! “I found the VO2max testing at Physiologic an invaluable tool for a middle aged long distance runner like myself. The test results enabled me to structure a training plan knowing which target training zones (heart rates) I needed to be achieving for me to head towards my fitness & running goals. The results were interpreted & explained by Mark (also a passionate runner) in a way that was both useful & highly constructive. The baseline results will be something I can also use to benchmark against future test results as well as useful for further goal setting. Speak with any distance runner & they will always tell you they want more speed for their distance event, the VO2 Max test is a scientific measure that can help runners strive towards that goal. In particular the fuel burning profile I have found invaluable as it is an excellent tool in planning pace strategies for me to aim for throughout an event. “I struggled with bulimia for much of my teenage years, though I had won the battle with my eating disorder I struggled with losing weight after the birth of my daughter. I ate well and went to the gym five days a week but failed to lose any weight. I also had a real desire to start running but could not manage to run more than one kilometer. After undergoing the Metabolic Testing I discovered that I did not lose weight easily as my metabolism had been affected by my eating disorder. “Good morning – Am just writing in regards to the metabolic/VO2 max testing I have recently done with PhysioLogic, firstly it’s fantastic to see that a physio practice is so proactive and willing to put together such accurate and vital information for exactly what I needed being an up and coming athlete – it really blew me away just how specific it really is based on my body’s ability to use oxygen and more important how much fuel I was using, not only had this information been vital in my progression of triathlon but i have been able to apply the science and knowledge you have given me to help me with my own training. With this being said I could have never asked for a better test and wish everybody would take the opportunity to really invest in some time to get the best out of there body both physically and nutritionally. “Metabolic Profiling is a winner! My next goals are Qld Road and TT Champs, then World Masters Games, Sydney in October. The Heart Rate Zones have taken all the guess work out of my training and racing. I have also noticed good improvements with my carbohydrate stores. E.g. more energy at end of the race when it counts! “Before having the VO2max testing done I was constantly exercising hard but not smart. I wasn’t aware that training within certain training zones could help me with increasing my fitness and burning unwanted fat. “The VO2 max testing allowed me to really get to know my body,(my legs! ), for what it is capable of. In preparation for my marathons I have put myself through the test, really getting to the very max of my endurance, sweating all over! Getting my results and a training plan to follow in order to achieve my running goals, fantastic! The good thing about doing the VO2 max test a second time, is to see the improvement, translated into graphs and numbers, very inspiring!